Barbados Tourism Authority should hire Tahir Quraishi NOW! 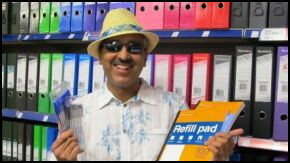 That happy guy in the hat, sunglasses and holiday shirt just happens to be one of the best managers in the 238 store Ryman Stationery chain. Tahir Quraishi is jetting to Barbados in mid-May to meet with Chairman and Dragons’ Den star Theo Paphitis and the other top store managers. It will be a week and a bit of fun and sun, but Tahir and his companions will also be advising boss Paphitis on how to make Ryman Stationery better and drive traffic and profits north on the little charts. Tahir is an expert in making those arrows go up and that’s why he’s invited to Barbados. You see, Tahir and his friends have each proven with their individual stores that they are the best, they know their business inside and out and they are capable of providing the advice, leadership, knowledge and example to take the entire organisation where it needs to go in these challenging times. That’s why Ryman Stationery is treating Tahir and their other top performers to Barbados all paid for. Management knows that if they want the company to improve and grow, they have to listen to the best: those who have proven their worth hands on in the trenches. Contrast that with the Barbados Tourism Authority. How many “hands on” people on the BTA board have proven themselves as top producers in the tourism industry? Uh, ya… that’s what I thought. Our proposal: Hire Tahir Quraishi for the BTA. Okay, so Tahir isn’t from the tourism industry, but could he really do any worse than the current performance? I guarantee this: Tahir would look at everything with a fresh eye, spot 3 big problems and 3 big opportunities on the first day and make things happen in a few weeks. I know that because he comes from a corporate culture where if you don’t perform, you don’t last. There’s a lot the BTA could learn from Tahir and his companions. If the BTA Board put aside their egos and called up Tahir and his boss Theo Paphitis, they just might find some ideas for getting those little arrows on the charts to head north again. Wait a minute…..this guy’s name sounds like he could be a Muslim….coming here to corrupt us all with his sharia law. I guess it’s OK as long as he’s a capitalist! What is very interesting in this debate is the fact that we never ask the hoteliers what promotion have they done lately to promote their hotel. What they do is go on a junket, stand around a table that the Tourism authority arrange at a show, do not go out in the market place a prospect for business. What they do is expect the Barbados Tourism Authority to get people to come to Barbados, and when they do they do not know how to treat them. The BTA never owned a hotel where they can negotiate rates. They never owned an airline to determine airfares. they often provide leads to hoteliers who never respond. Our customer service is the laughing stock of the industry. Our hotels are marginal in comparison to our competitors and over priced. Take a triop to some of the other Islands and see what customer service is all about. If we don’t chang our attitude many of them will close and sure some need closing. Ok, just Googled – even Beaverhausen is not Original – from Will & Grace? So if you have no Original ideas then whose ideas are you touting – CAL’s or LIAT? As a fellow Brit, I can assure you that like 99% of Asian businesses in the UK, and perhaps the rest of the world too, he almost certainly doesn’t employ any BLACKS or, certainly, any AFRO CARIBBEANS, so let’s see this hoopla in its right perspective! Of course, Bim IS a black country – ironic, isn’t it! For those kinds of results, you need a British psyche, which clearly Bajans don’t have, or you need to hire one. I’m waiting for the call! TWW, doan mek me laugh!! LOLL!! At least I, am a normal decent CHRISTIAN, AND PROUD OF IT!! Ian, I loved Beaverhausen. There was no need to keep changing a name like that. She was a little too personal and had too many multiple personalities, but she kept us all amused, somewhat like one of Jack Bowman’s grammar lectures! It has been many times said, that tourism has been the vehicle that gave rise to the economic development in Barbados and many other islands in the Caribbean; and this has in essence shaped the future development of the region as a whole. Furthermore, there is a general consensus that supports the view, that in a region with limited or no natural resources, but its pristine beaches and the cordiality that reflects the characteristics of it s modern ethos. It makes good sense to still look toward tourism as one of the medium through which to gain the foreign dollar. Nevertheless, has this economic prosperity that has been gained through the medium of tourism, created atmospheres that given rise to attitude of impertinent towards Barbadian people? Some tourist is of the opinion that because our dependency on tourism reflects our survival that it gives them the right to act without impunity on our island. Moreover, Barbadians don’t have to accept disrespect from some tourist who believe that their do not have to conform to the prescribed mandates that govern our society. And this attitude is rooted I believed; in the Conventional atmosphere that has been creates to accommodate tourist to the island. With this been said, I have visited Barbados on numerous occasions and I have experiences first hand some of the inappropriateness Barbadian continues to accept all in the name of tourism. But does it worth the risk of sacrificing our national pride to appease those who in my view ‘hold a less than favorable opinion of us; we somehow believe that it is in the best interest of our country to accept kind insolence? The greatest American abolitionist Fredrick Douglas eloquently states, that if we want the respect of others, we must first respect ourselves”. If we abandon the belief that we’re valued then how do we expect other is going to view us? We need not concern ourselves any further with tourist who uses the shortcoming of one island, to cause dissention between the other islands. If Barbados is dirtier done another islands as the tourist contends, don’t come back to our island, because we never claim to be the cleanest island in the Caribbean anyway. It shows the kind of respect you have for the people of Barbados by insulting our intelligence, you criticized our island then make the vacuous comment that you are not referring to the people. The island reflects the people and vice versa, so if you contend that the island is dirty then in essence you are saying that the people are also dirty. It seem like some Barbadians are frozen in these stereotypes when it comes to engaging the tourist; we have to be very careful that we don’t sell away our national pride all in the name of the foreign dollar and tourism. Even though we have this propensity to pretend that we are more important than our fellow Bajan; we somehow loose all concept our self value when engaging the tourist. It is time that leaders of the Caribbean think seriously about the true economic survival of it people. It seems that our livelihood is directly tied to the countries in Europe and the United States of American. Someone once said that, ‘the essence of stupidity is doing the something over and over and expecting difference results”. In this new global economy countries of the Caribbean must be progressive in their outlook as it reflects the total success of the region. I have hypothesized that countries in the Caribbean must look toward intellectual capital as their progress in this new global economy. We must adopt the same thinking strategies like countries Chinese, Japans, and India. We have to recruit the brightest minds from all the islands of the Caribbean and send them to the universes in the United States and Europe; to studies the latest technologies and sciences. So that there can come back to the islands and teach these skills to the region. Then we can do like India and China export our skills to the United States of America and Europe and in the process attract companies to the region because of these skills. Then our dependency on tourism and agriculture would not be necessary to sustain us economically. We have the potential in the region to make this become a reality. If a Nigerian refugee can leave the Biafra camp in the 1970scome to America, and be responsible for our internet to operate the way it do .Then we know that this come became a reality. The illustrious and eloquent Jamaican Civil Right Leader Marcus Garvey once said, that God and nature made us who we are, and then through our own creative genius we made ourselves who we want to become. Follow all the great principle, let God and the sky be our limit, and eternality be our measurement”. If we can dream it than it can become a reality, we just have to put it in practice. Bermuda to limit cruise ship passengers on public buses!